Clinton had not surrendered at this point eight years ago—and the party still came together at the convention. Last week was the harshest so far, by far, in the presidential contest between Hillary Clinton and Senator Bernie Sanders. It was childishly harsh, with the “she did it first” back and forth over who said who wasn’t “qualified.” But was it harsh enough to hurt the party’s chances to unite in November against the Republicans? I don’t know the answer to that, for sure, but let’s remember: this is nothing compared to 2008. As if to remind us, Monday marks the eighth anniversary of the discovery of remarks by then-Senator Obama, made to a roomful of wealthy San Francisco supporters, about white, working-class voters in Pennsylvania. It was supposed to doom his candidacy—not just according to the GOP, but to other Democrats, and not just Democrats on Clinton’s team. You go into these small towns in Pennsylvania and, like a lot of small towns in the Midwest, the jobs have been gone now for 25 years and nothing’s replaced them. And they fell through the Clinton administration, and the Bush Administration, and each successive administration has said that somehow these communities are gonna regenerate, and they have not. And it’s not surprising then they get bitter, they cling to guns or religion or antipathy to people who aren’t like them or anti-immigrant sentiment or anti-trade sentiment as a way to explain their frustrations. Recorded secretly by a Huffington Post “citizen-journalist,” Obama’s remarks—and the reaction to them—dominated several news cycles. Clinton was already winning working-class whites in states like Ohio and Texas; this incident provided an ex post facto rationale that didn’t involve his race, but rather his supposed “elitism.” At the time, I argued that Obama’s remarks, in context, were actually sympathetic to the working-class whites he was describing. But it was clear right away that the flap was going to hurt Obama, at least for a while. While Clinton’s current supporters have warned Sanders not to take hard shots at the party’s likely nominee, given that the Vermont socialist has a near-impossible task to catch her in delegates, they ought to recall their candidate’s response to Obama’s unfortunate comments back in 2008. Card-carrying Democratic Leadership Council Senator Evan Bayh even used Obama’s comments to make the case to super delegates that Obama wouldn’t be able to defeat Senator John McCain in November. “They’re going to say that we’re weak on national security,” Bayh said, “that we’re a bunch of high taxers and spenders, and out here in the middle of the country we don’t understand people’s values. The question is, have we given them some hook they can hang their hat on to make that argument?” The New York Times reported at the time that Barack Obama was furiously working the phones, trying to reassure superdelegates that he hadn’t destroyed his candidacy. “People in rural Pennsylvania don’t turn to guns and religion as an escape,” Pennsylvania Governor Ed Rendell, an ever-loyal Clinton supporter, piled on. “Hunting and sportsmanship are long-established traditions here, and people of faith founded the commonwealth and continue to live here. What the senator has done is essentially misread what is actually happening in Pennsylvania.” Rendell suggested Obama had mortally wounded himself in his state. Clinton did win the primary—but Obama won Pennsylvania that November with 54.7 percent of the vote, almost four points more than John Kerry in 2004. The bitter exchanges didn’t even end there, in mid-April. Clinton had yet to make the unfortunate, racially loaded appeal that Obama wasn’t connecting with “hard-working Americans, white Americans”—and that she was. The Obama team hadn’t yet scorched Clinton by charging she had intentionally played on fears of Obama’s assassination, when she argued for her continued candidacy by noting that other Democratic contests had continued through June, and referenced Bobby Kennedy’s murder that month in 1968. And of course, at this point, Clinton had already endured two months of pundits’ demanding that she get out of the race; in May, MSNBC’s Keith Olbermann would famously suggest that a superdelegate ought to “take her into a room, and only he comes out”—figuratively, of course—in order to stop her candidacy. I remind us of this bitter history not to say “Bombs away, Bernie and Hillary!” or to argue that the 2016 race shouldn’t stick to the issues. I just think it’s worth noting that these contests get hotter as the race goes on, and both sides become less adroit about highlighting legitimate political differences without insults—and yet, the party still came together that November. The 2008 Clinton team was in the same position as the 2016 Sanders team is now: Her campaign picked up momentum late, but having lost crucial early primaries (and in her case that year, caucuses), she couldn’t close the delegate gap with Obama. (In 2016 terms, she had to #feelthemath.) Like Sanders supporters this year, angry that the deadline to change your registration to “Democrat” in New York was in October, or that Wyoming’s caucus absentee-ballot rules let Clinton keep pace there, 2008 Clinton backers complained that the primary rules were rigged against her—particularly because Michigan and Florida, which were strong Clinton states, didn’t count that year, because they had defied the Democratic National Committee and scheduled early primaries. As a Clinton supporter, I remember thinking for a while that it was crazy to ignore results from those states. But in fact, it wasn’t crazy but fair, and Clinton had signed on to run for the nomination under those rules. Still, the New York senator suspended her campaign only after the last primary in June that year. She dropped her bid to win over superdelegates—she trailed Obama in pledged delegates by 100, but essentially tied him in the popular vote, and he needed superdelegates to get him over the threshold for the nomination. But there was even a little drama at the Denver convention in August: Team Obama wanted him nominated by acclamation; some of Team Clinton wanted a roll-call vote, to reflect her “18 million cracks” in the glass ceiling of presidential politics. In a compromise, Clinton herself, standing with the New York delegation she’d won, nominated Obama by acclamation. We know how the story ends: The man Clinton once argued was a doomed candidate won two terms as president. There are two reasons to worry that unity might not be as easy in 2016, even if the actual nominating contest is less bitter this year (so far). One is that Sanders is bringing many voters into the process who aren’t Democrats, and have no interest in preserving the party or fighting a united front in November. 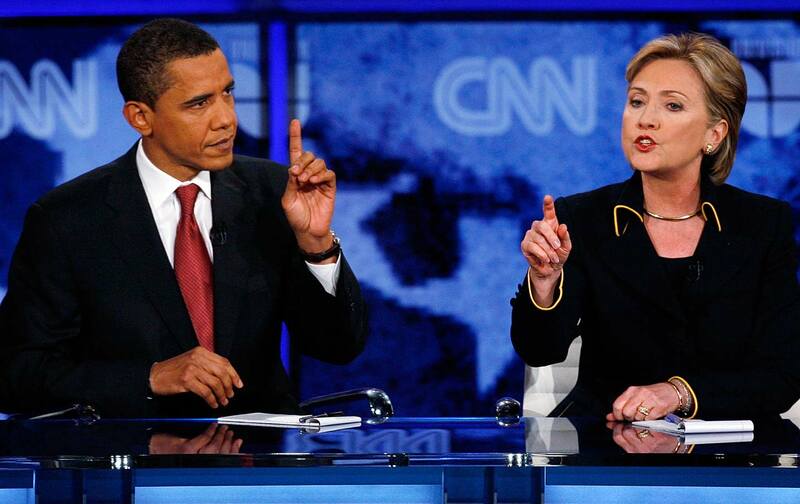 Another is that there is an ideological gulf between the candidates that didn’t exist in 2008. Clinton wasn’t angling to push Obama left or right, or to alter the Democratic platform, as Sanders certainly (and rightfully) will if he is not the nominee. So we can’t take for granted a repeat of the post-primary unity we saw after a nasty contest in 2008. Still, let’s not pretend that, by this time eight years ago, Obama had the luxury of merely thinking about who to choose as a running mate and how to win big swing states like Ohio and Florida. He didn’t. Sanders and Clinton took steps toward reducing last week’s tension by telling reporters this weekend that of course they will support their opponent in November, if their campaigns fall short. That’s probably the best Democrats can hope for at a moment like this.